I had to post this so you could see where that structure was from yesterdays pic! You really have to squint for this one! These are rocks that shoot straight out into the ocean. About halfway is the little building. You can imagine my surprise because from here it looks like a cement pillar or something. You might have to enlarge this to really see the thing! No way, you couldn't have picked it! What a lucky find it was!! Love this shot too. Wow! That's the little building?!?! Amazing!! Yikes...you mean it goes that much further???? This must be enormous! @kiwichick :D Thank you, Lesley! @cheyrebecca Crazy, isn't it? Who knows what that was built for! Great photo! You can se why it was constructed... The rough water on the right contrasts well with the stillness on the left. @orangecrush Hm. Did you purposely spell my name wrong? LOL. Not that it really matters. Just curious. haha. hhmmm. I thought it was at the coast. Did you walk across all those rocks to get to it? @annaruth Yes! Can you believe it! @orangecrush haha! now that's called dedication. makes me appreciate the photo a bit more (though I already found it amazing). The things we do sometimes for a good photo... worth it! @revjoel Lol! Thank you, Rev.! great perspective and I love the choice of B & W! Awesome shot Jerry. Works so well in B&W and the textures are amazing. Thanks also for your kind words and thoughts. LOVE how you framed this! Spectacular shot! Love that perspective and composition, and all those awesome textures! Great detail and perspective, Jerry! I do like the composition and the contrasts of the rough sea and the calm bay area. Like the roughness of the rocks too. Great pic and find. That was a hell of a trek!! Fantastic textures in B&W. I'm amazed you found that little structure so far along! Wow, how bizarre! Love the contrast to yesterdays shot, the b&w is great! wow, would not have imagined it was that far out.....how strange!!! Amazing shot, love the B&W!! Seems to go on forever. Great perspective. Amazing. Great perspective. Those rock must be difficult to walk on in order to get to the building. Such an awesome perspective and beautiful place. Hard to believe that is the same building. Great capture and love the b&w! Excellent shot and perspective Jerry! Amazing perspective and love the rugged texture of the rocks! Fabulous! Beautiful photo! At first I thought it was a couple at the end of the rocks! wow jerry. i find that so interesting!!!! i can imagine what you thought when you seen it and then walked up to it!!! unreal find!! i LOVE this shot as well and it is a total fav for me!! 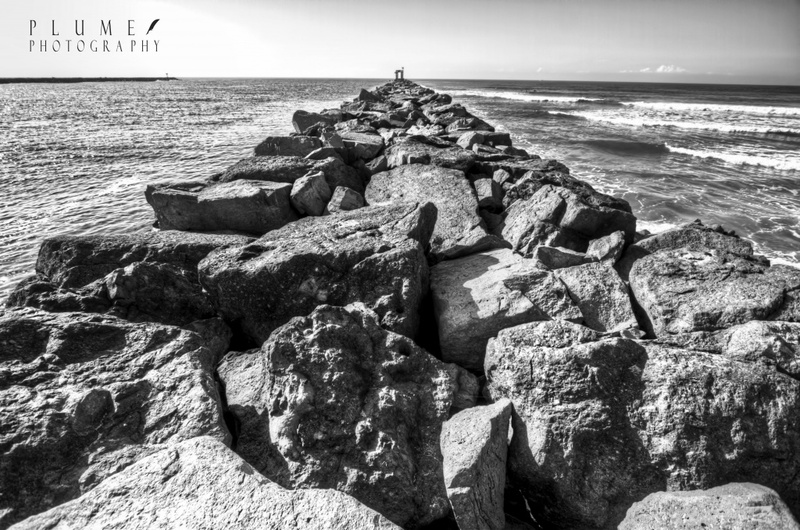 amazing textures in the rocks, the POV is UNREAL, and i loooove this in black and white!!! AWESOME! I seriously did squint! Nice shot!!! i love it, it looks so lonely. what a great location. Such a cool shot, a Fav! Wow! So cool to see the other view of this scene! Incredible! that is crazy! you walked out there? love seeing the big perspective - just too freaking cool. Wow. Awesome photo. Great POV. How extraordinary! I never would have guessed! I want to live where you live! I never find anything this beautiful here!! This is most definitely a fav!! Wow, that is the coolest!! What a brilliant find!! Great composition, really draws in the eye. You've done that never ending thing again! Love the depth and ruggedness of this shot. very cool composition and textures! Great shot, just pulls your eyes right into the picture.